A house in the city stands mute witness to the last months of the legendary artist’s life and work. 23, Ganga Ram apartments: Amrita Sher-Gil’s house in Lahore. It seemed like a futile search. The legendary artist Amrita Sher-Gil had much to do with Lahore, and yet we could not find the house where she lived and painted in her last months. Born of Indo-Hungarian parents, she was conceived here and came back in 1937 from Paris for an exhibition at the famous Faletti’s Hotel, to resounding success. Later, she was to set up home in this vibrant city. We were told it still existed — the house where Victor Egan, her husband, had his clinic on the ground floor, the living quarters on the first floor and a barsati surrounded by a terrace, her studio, on the top floor. It was from her studio that she saw a milkman with his buffaloes and did her last unfinished painting. Slate black buffaloes squat on the ochre road, one with a crow perched on its snout. A woman draped in a red veil dries cow-dung cakes on the terrace, the red caught by the portico at the back bursts into a flame in the distant horizon. This was the pastoral view from her studio, which she captured on her canvas. But equally, it was the transportation of the feudal world she had known into the culture of the throbbing city that was Lahore. The red at the back is like a tongue of flame emblazoning a new trail of imagination, the painting a possible breakthrough in yet another direction, abruptly terminated by her sudden death. The one person who did know was veteran Lahori Pran Nevile, in the city for the Lahore Literary Festival (which took place in February). At the Gymkhana Club, where we were staying, he pointed northwards. He said, “Just go further down near the high court, next to it is the Ganga Ram Building and behind it are the Ganga Ram apartments and one among them is her house.” We tracked it with determination on our last day in Lahore. 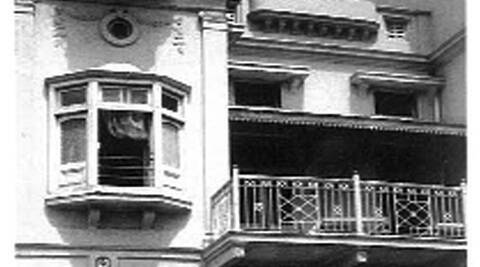 Off the busy Mall Road, behind the Ganga Ram Trust Building, were the Ganga Ram mansions built by famed philanthropist and civil engineer Sir Ganga Ram. We found two rows of elegant stucco buildings that seemed to belong to another era. Finally, at the end was 23, Ganga Ram Mansion, where Amrita spent her last few months. From the road we could see the topmost barsati, where she must have spent a great deal of time painting. But the back view is no longer pastoral. In its place, many new buildings jostle for space alongside each other. Suddenly, a kind, middle-aged woman and her daughter sitting in the balcony opposite called us up to join them for a cup of tea. We climbed the lovely old wooden staircase to their identical house and gazed at the high ceiling of the rooms, the fireplace in the dining room and the spacious balcony where they sat. The lady said that she knew the house opposite belonged to the famous artist because her neighbour, a painter called Afzal, was her friend and had talked often about her. She said that the painter mentioned that Amrita was a nice person, and kind and generous. These elegant row houses are no longer in their prime and could do with some restoration. They stand firm, however — a testimony to the period in the Thirties when they were constructed, when the city was in its prime, where artists like Abdur Rahman Chughtai and Bhabesh Sanyal lived and writers like Faiz Ahmed Faiz, Khushwant Singh and Amrita Pritam attended soirees. The Indo-Saracenic Lahore museum was close, with its marvelous Gandhara collection and Indus Valley relics. Amrita visited often and would gaze at the miniatures. The barrel gun that stood outside had been mentioned by Rudyard Kipling in Kim. Inside hung the sole Amrita Sher-Gil painting Veena Player (1937), purchased by Charles Fabri for the museum. This was the city Amrita Sher-Gil had come to in September 1941, full of hope, and planned for an exhibition in December. But before that could happen, she took ill and died suddenly. The exhibition was posthumously held. It was on the midnight of that fateful day of December 5 that Amrita died thinking of colours. Her husband Victor stated, “She kept mumbling about colours — blues, reds and greens and violets, all sorts of colours. Unconsciously or subconsciously, she was still thinking about colours and light and shade. Then she went into a deep coma…” And colours are what her last unfinished work is about, seen as sheets of planes rather than as mass. Was she heading towards greater abstraction in her work? Would she have spun a whole suite of paintings following this, memorable for their sensuous plasticity? Who can tell — we only know that the house in Lahore stands firm, a witness to the remarkable 28-year-old artist and her last days of achievement.